As you may know, T-Mobile’s high-speed 4G network which the mobile carrier claims as the largest 4G network in the country is currently covering over 200 million people in 184 areas nationwide. In order to utilize the lightning-fast 4G network, you will need to upgrade your handset to a 4G-enabled smartphone. If you’re considering to change to a 4G phone, in my opinion, HTC Sensation and LG G2x/T-Mobile G2x (also called as LG Optimus 2x in other regions) are a pair of high-end, premium smartphones from T-Mobile that worth considering. If you got the same thought with me, and would like to consider on which one is more suitable for your to purchase, do check out the following comparative table of HTC Sensation 4G vs LG G2x or T-Mobile G2x that indicates the differences between features and specifications of both phones. From the table above, the specifications of HTC Sensation 4G is noticeably better than G2x – larger, sharper display and more powerful processor as well as RAM. However, LG G2x is lighter, slimmer and smaller when compared to the Sensation Android smartphone. As both Sensation 4G and G2x carry the same initial subsidized price tag of $199.99 on a new 2-year service contract after a $50 mail-in rebate, I think the newer HTC Sensation 4G is more worth to purchase since it is definitely the winner in this battle. 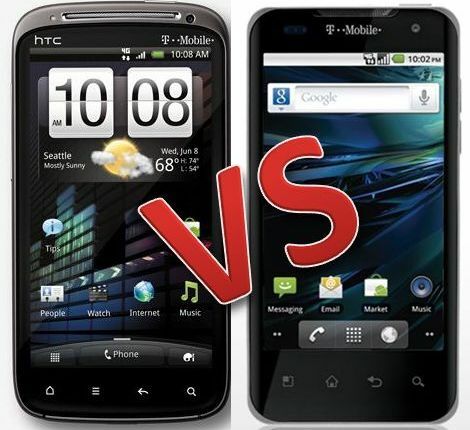 Note: The new HTC Sensation 4G is expected to be available exclusively for T-Mobile customers starting June 15.